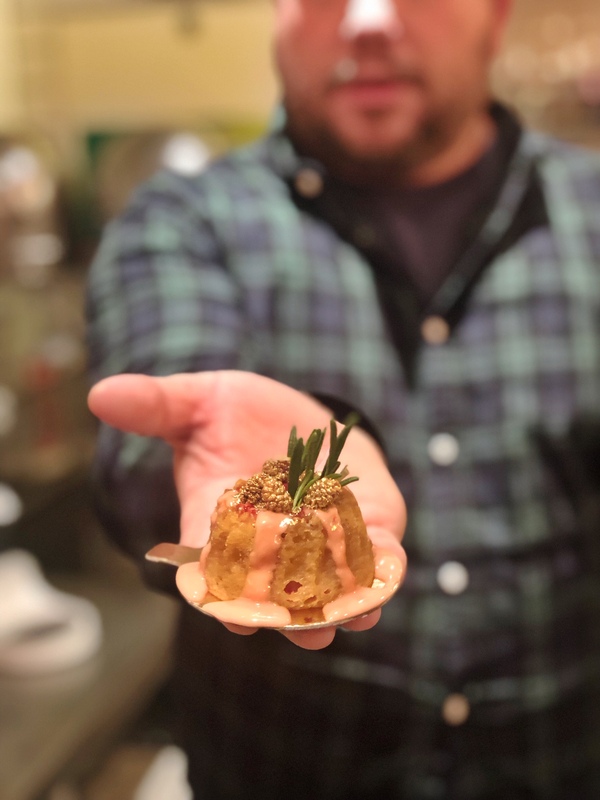 ONIN London > Arts > Boodles Mulberry Delight. If you are looking for a gin-infused vegan Mulberry cake this festive season, then Christmas has come early for you. 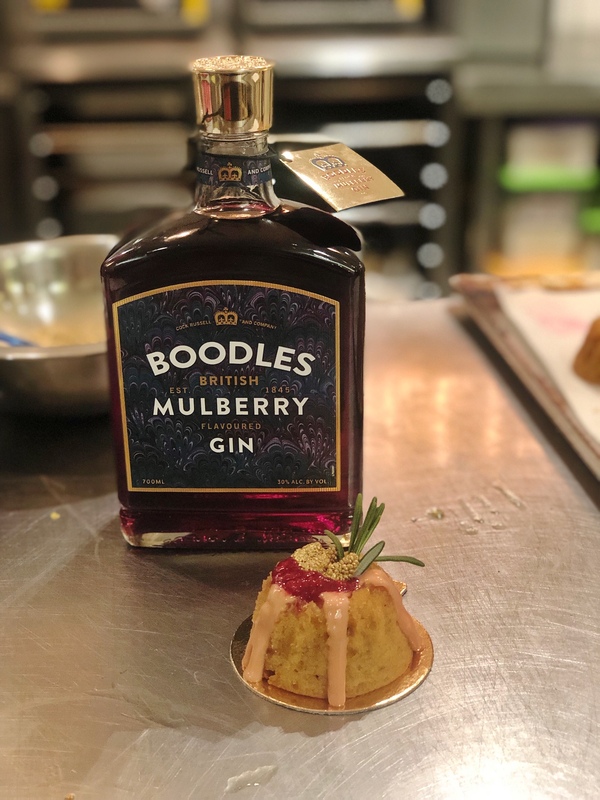 This year, Boodles Gin and artisan bakery Lily Vanilli have partnered to create a truly delicious new culinary treat- Boodles Mulberry Delight. 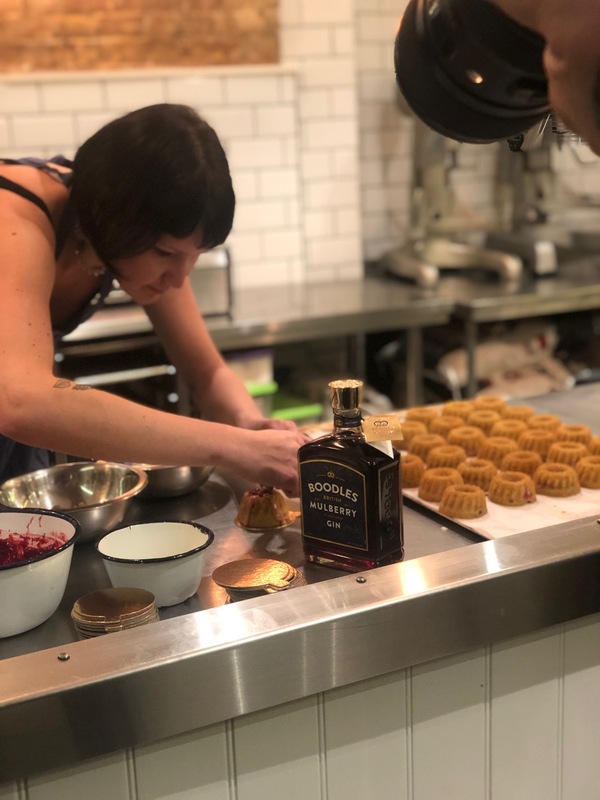 On 5th December we joined Lily at her artisan bakery just off Columbia Road and representatives of Boodles Gin to have taste and decorate the dairy-free Boodles Mulberry Delight cakes. Lily enthralled us with her demonstration of how to make the cakes. The recipe is below and makes 15 cakes. Now anyone who knows me knows I hate being in the kitchen and have no patience for baking, but this recipe seemed so quick and easy I think even I could make it. Lily then showed us how she was decorating the cakes to sell in her bakery. Her inspiration was from a Christmas wreath, so the icing was drizzled vertically on four sides. The icing is pretty sticky and does drip. You then scoop in some gin jam for the filling and top with gold-dusted mulberries and a sprig of rosemary. As it’s a versatile cake, Lily encouraged us to experiment with additional toppings and garnishes should we make the cakes at home. As Lili says, the cake is a real celebration of the flavours of Boodles Mulberry Gin-nutmeg, rosemary, juniper with juicy raspberries and mulberries. The Mulberry Delight cakes were so moorish we had trouble stopping at two. My friend described them as ‘little pieces of heaven’ and I have to agree with her assessment. 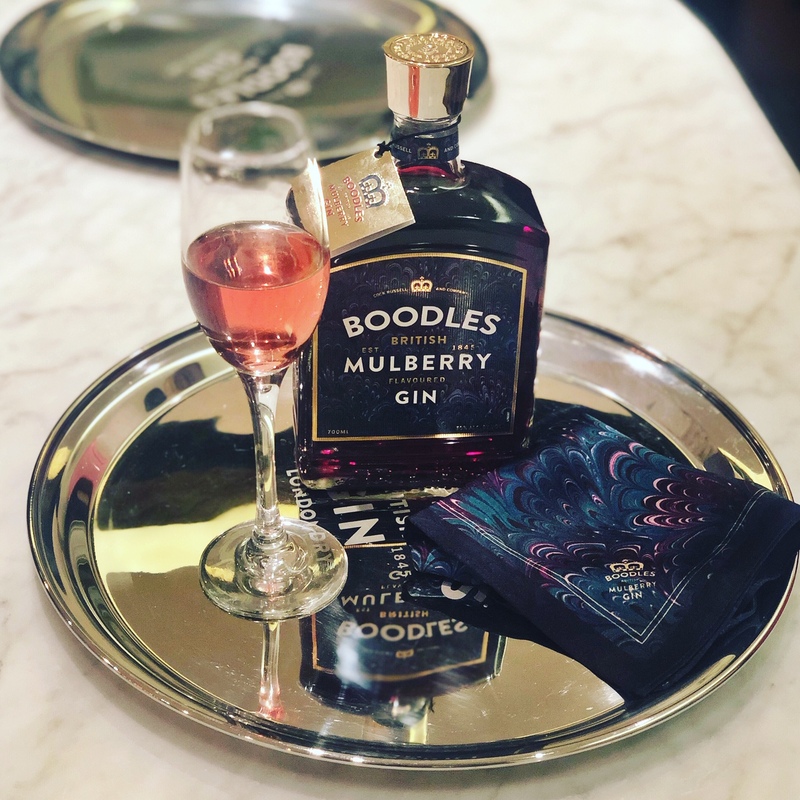 During the demonstration and decorating, we sipped on Boodles Royale which is the name of a concoction comprising 30ml of Boodles Mulberry Gin and 90ml of champagne or Prosecco. It was served in a champagne flute for extra festive cheer. We loved this so much we’re planning to make some at home. Established in 1845, Boodles Gin is a premium British gin produced exclusively in the UK. It was named for Edward Boodle, who ran an illustrious private London gentleman’s club. As a London Dry it has a balanced flavour which comes from the sage, rosemary and nutmeg botanicals. The deep red colour and the tastes of the gin help create a Christmas time atmosphere. A clean and crisp liquor its perfect for gin & tonics or martinis this festive season (or any season really). Boodles Gin is available for purchase starting from £20 at M&S, Sainsbury’s, Morrisons, Asda, Tesco Northern Ireland, exclusive bars and retailers and online at Amazon. The Boodles Mulberry Delight cakes were available throughout December at Lily Vanilli bakery in Columbia road for £4 a cake. They can also be ordered via email at order@lilyvanilli.com. Or do what we at ONIN London plan to do- impress our friends with making these scrumptious cakes. 0. Preheat oven to 180°C. 0. Combine the sugar, baking soda and salt evenly with the nutmeg. 0. Whisk together the wet ingredients with the dry ingredients until you have a nice smooth batter. 0. Divide the mixture into individual cake tins greased with a little more olive oil, filling 3⁄4 of the way to the top but you could use a cupcake pan. 0. Bake for 15 minutes, or until a cocktail stick inserted into the center comes out clean. Remove from the oven and leave to cool completely. 0. Whilst the cakes are baking, start on the jam. Heat the raspberries and gin in a heavy bottomed pan over a medium-low heat until thickening and the fruit falls apart (around 10 minutes). Leave to cool completely before straining through a fine mesh sieve. 0. For the icing, combine gin and icing sugar in a bowl with a whisk until you have a smooth, thick icing. 0. Once the cakes are cool, pipe or spoon on a drizzle of icing. Fill with jam and garnish with the herbs, flowers and mulberries dusted with gold. Opening hours: 8:30-3:30pm every Sunday, or until the food sells out.